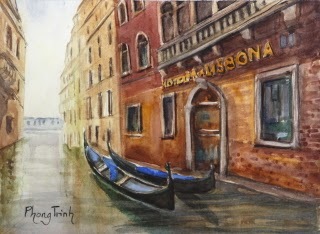 I tried to balance the mood and atmospheric of Venice and deep vibration colors of the scene. I gazed at the organic feel of Venice water, the feature and the architecture of old building, the rich texture of the old brick wall and their reflection onto the deep water. The pair of gondolas moored cozily close together in front of the three star hotel, Lisnona, toward the open sea echoed the romance of the place. It was an intense painting process. Finally, I got to enjoy the treat of the finishing touch, a few strokes on the wall of the hotel to note the brick work!.